This morning I nearly melted at the bus stop. Although, I’m pretty sure most people experienced something similar…It’s hot out, we already know that. The bus however was freezing cold. I had goosebumps….I figured that it’s just my luck that I’m going to be the only person to catch a cold in this weather. Anyways, I got off the bus back into the humidity, and instantly my glasses fogged up. My hands were full so I couldn’t wipe my glasses off and I had to walk for 5 minutes with extremely fogged up glasses. I was terribly nervous that my impaired vision was going to cause a fall or injury because I’m cool like that. How embarrassing and awkward. 1. Beat 3 egg whites and a pinch of salt until peaks form. 4. 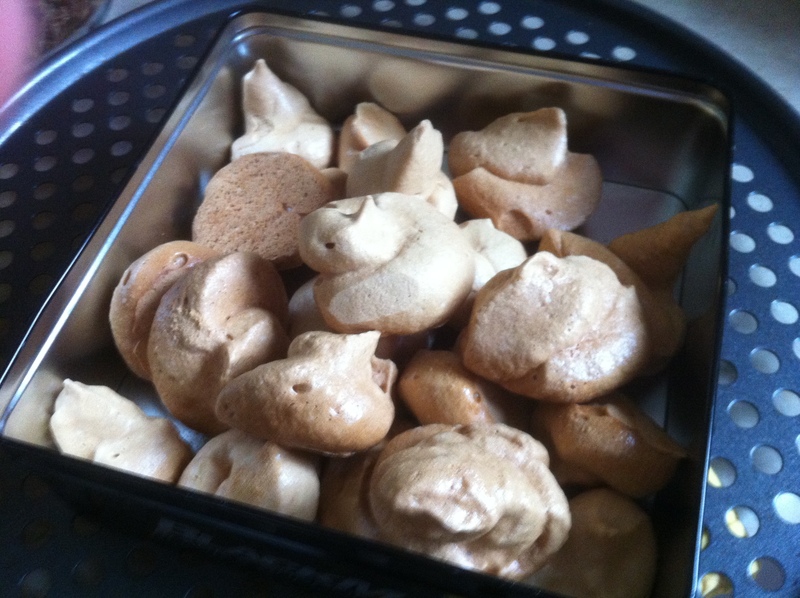 I put the batter into a bag with the edge cut off and did my best to pipe the batter into cute little meringues. The book also said you can put them on a baking sheet by the spoonful, but I imagine that would look even worse than my sorry attempt at piping. I think it makes close to 40 little cookies. The brown sugar gives them a great caramel-like taste. And even better, they are like 11 calories a piece! I made my own version using 1 cup of white sugar and 1 tsp of cinnamon. They were also very delicious and quite well-received if I do say so myself . Quite frankly I also forgot to write a recap of NYC…so stay tuned for that! Second sidenote, this heat makes me want to eat avocados morning noon and night. Does anyone have any good recipes to share? Love the travel mug, PG! Quite official, and very much up your alley. I feel your pain with the weather… it was 45C here today with the humidex, so I can relate well to your title. Perhaps check out the recipe at the attached link for a tasty treat to beat the heat (RHYME! ), although no avocados. cute travel mug! cant wait to see nyc recap! 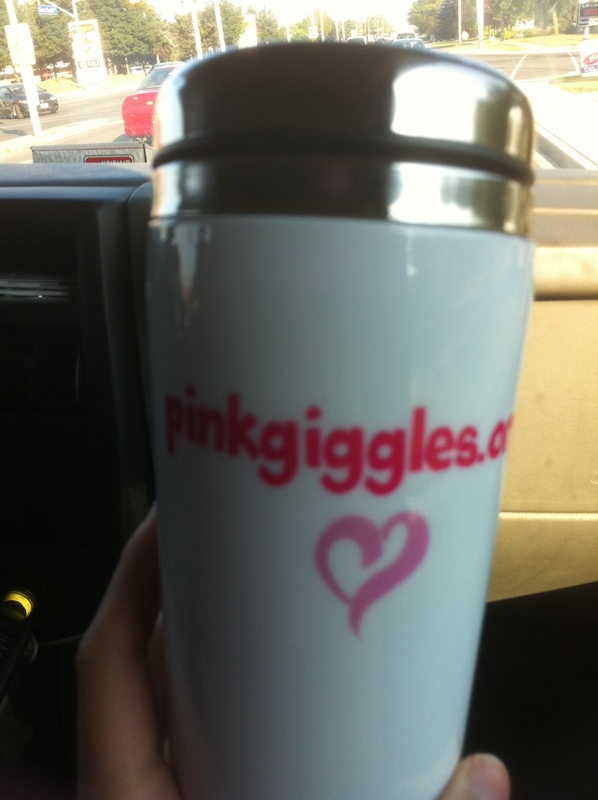 I love the travel mug – so cute! As for recipes….I’m very fond of those Vegan Carrot Spice Muffins that I found from Oh She Glows (you saw them on my blog today). Re: tweet about the incoming links: Google analytics and WordPress Jetpack (plugin) was suggested. I already use them both, and still am not convinced that I’m notified every single time people link to my blog (i.e.the home page). I receive e-mails about pingbacks / track backs when a specific post is linked, but not for the home page. Ggrrrr. Will investigate further; and let you know if I find anything useful.